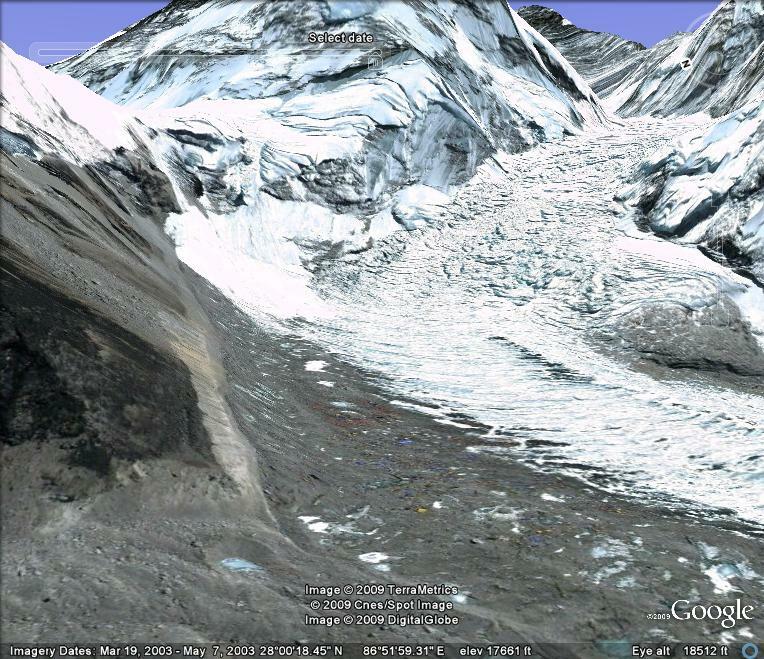 The Khumbu Glacier is a large debris-covered glacier in the Khumbu region. It is one of the more famous and often visited Himalayan glaciers as it is the key route for climbing Mount Everest. About 12 km long, it drains mainly from the West Cwm between Mt. Everest and Lhotse and ranges in altitude from over 8000 meters to 4900 m. The equilibrium line separating the region where snow typically persists through the year is 5600 m. Melting is very limited above 5800 m. The famed Khumbu Icefall transitions the glacier from the accumulation zone to the ablation zone. The ablation zone is where melting dominates. Base camp for climbing expeditions is on a debris covered portion of the glacier below the Khumbu Icefall, Pumori Lake is about one mile away. The debris cover is brought down by avalanches and exposed at the surface via melting. 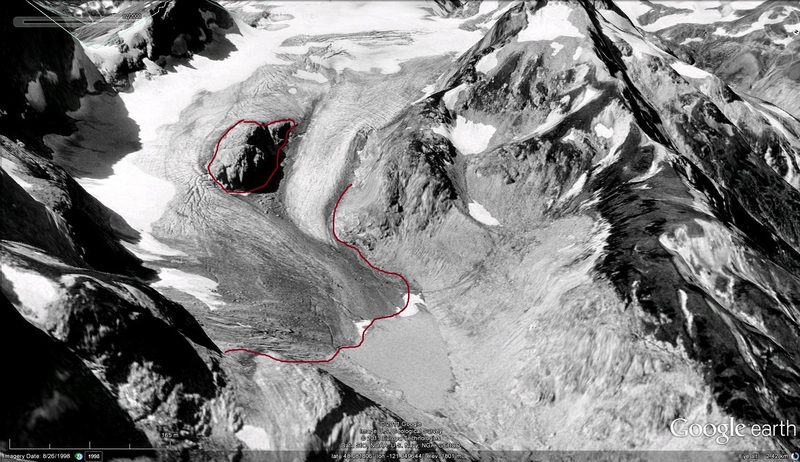 In the lower picture it is evident that the lower 10 km of the glacier is dominantly debris covered. The Kathmandu-based mountain research institute, ICIMOD, reports that the Khumbu Glacier is retreating at an average of 20m per year. The length of the glacier has shrunk from 12,040m in the 1960s to 11,100m in 2001. This 1 kilometer retreat has been consistently between 15 and 20 m per year during this interval. 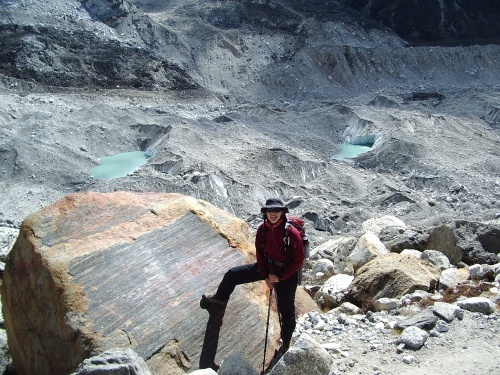 This retreat is less than nearby Ngozumpa Glacier and Imja Glacier. Everest Base Camp has actually dropped from 5,320m to 5,280m since Hillary and Tenzing first set up camp there more than fifty years ago. This 40 m of thinning at the base camp has occurred over this 55 year period. Base camp is on the right side of the glacier in this view notice the small colored blotches. Measurements of velocity on the glacier by Nakawao and others (1999) noted that the Khumbu Glacier near the climbing base camp slowed by 10% between 1958 measurements and 1995 measurements. Kadota and others (2000) surveyed the Khumbu glacier in 1995 and compared the results with those of the 1978 survey. They found that the surface of the glacier lowered about 12-15 meters over most of the length but by only 6-8 meters near the terminus. A recent paper by Bolch et al (2008) compared a Corona DTM 1962 image and the ASTER DTM 2002 of Khumbu, Glacier. During this interval the Khumbu Glacier thinned in the ablation zone by an average of 17 m, This is a rate of 0.4 m/year. 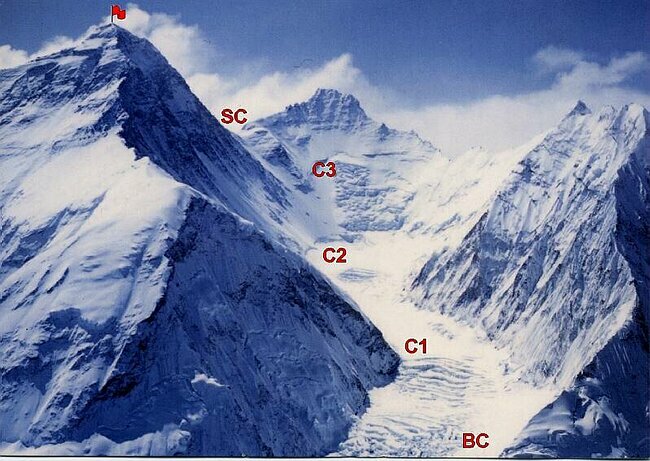 Thinning at base camp of 40 meters is greater than at the terminus. The result is a reduced glacier slope. Reduced slope and thickness both lead to deceleration. The reduced thickness loss at the terminus is due to the debris cover thickness increasing towards the terminus. 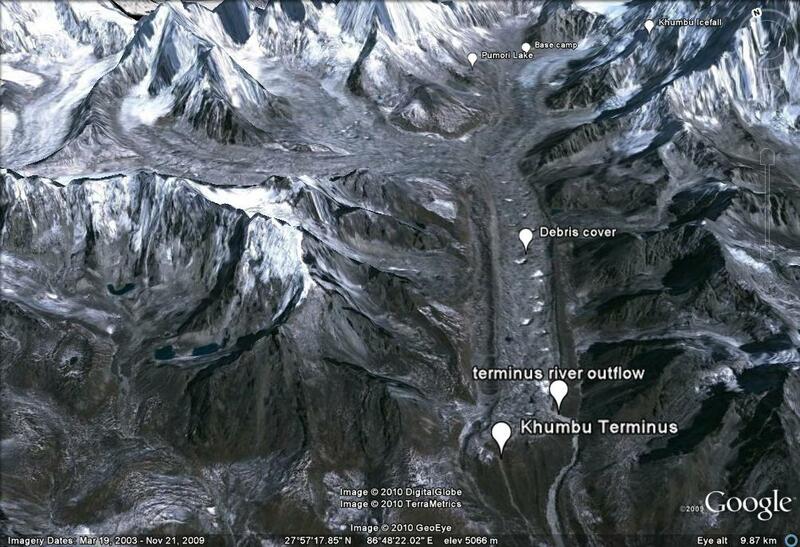 The same story is playing out on the Satopanth Glacier(Image from Jeff Engels) Takeuchi and others (2000) noted that for Khumbu Glacier debris cover less than 5 cm increases ablation, debris greater than 5 cm in thickness reduces ablation. On Khumbu Glacier their ablation measurements indicate that ablation is reduced 40% from that of clean ice when the debris cover is 10 cm thick. Thicker debris cover reduced ablation even more, but only slightly. This is the primary reason why thinning has been less near the terminus. Naito et al. (2000) developed a model coupling mass balance and flow dynamics of debris covered glaciers and applied it to the Khumbu Glacier. The model predicts formation and enlargement of a depression in the lower ablation area about 5 km upstream of the terminus. This depression could transform into a glacier lake in future. Given the more rapid melting upglacier of the terminus and the low surface slope of this glacier, this is a reasonable result. The movement of the glacier can be tracked by examining the movement of supraglacial lakes downglacier. Below is 4 lakes denoted in a 2003 and 2009 image, the mean movement has been 120 m, 20 meters/year. Given the slow rate of retreat and the 3000 m of altitude range above the current snowline the Khumbu Glacier is not in danger of disappearing with current climate. The entire Western Cwm the flat cirque seen beneath Nuptse, Lhotse and Everest here is in the permanent snow zone above 6000 m. The icefall then descends to 5400 m. The terminus is at 4900 m. It is not difficult to imagine this lower section of the glacier below the icefall wasting away. It is likely that a substantial proglacial will develop as is occurring at Ngozumpa Glacier and has occurred at Imja Glacier. Kadota, T., K. Seko, T. Aoki, S. Iwata, and S. Yamaguchi. 2000. Naito, N., M. Nakawo, T. Kadota and C.F. Raymond. 2000.
area. Ann. Glaciol., 28, 118–122. Honeycomb Glacier is one of the longest and largest glaciers in the North Cascades. It is currently 3.7 km long and has an area of 3.1 km2. It has retreated 2.05 kilometers since its Little Ice Age Maximum. The glacier was an imposing site to C.E. Rusk who recounted his early 20th century exploration (1924). Like all 47 glaciers observed by the North Cascade Glacier Climate Project it has retreated significantly since 1979. A 1960 photograph taken by Austin Post shows the glacier ending with no lake at its terminus. The terminus is gentle and has no crevasses, indicating it is relatively stagnant and poised to melt away. The glacier has retreated 1.3 km from its Little Ice Age moraines at this point. In 1967 another Austin Post image indicates a new small lake forming at the terminus. In 1995 we visited the margin of this lake, where the glacier ended in 1967 and took a photograph back to the glacier. As seen below retreat to this point was 400 m. A pair of images from Bill Arundell in 1973 and Lowell Skoog in 2006 indicate the scale of the retreat, these images do not show the actual terminus but do show the main nunatak-rock island and how much it has become exposed in the 33 years. This nunatak was hardly evident in 1960, and in a 1940 image of the glacier literally did not yet exist. The terminus had retreated 400 m from the 1967 position to 1995. In 1987 a new lake began to form at the terminus of the glacier at 1680 m. The glacier is shown ending in this lake in 2002 from both the far end of the lake and the nunatak above the lake, the glacier had retreated 210 m since 1995. In 2006 the glacier retreated from the end of this lake. This is a shallow lake that may eventually be filled in by glacier sediments. The terminus is flat and stagnant ending at 1680 m in the lake. Thus, the rapid retreat will continue, the glacier is still not close to acheiving a post LIA equilibrium. Glacier retreat from 1940-1967 averaged 9 m/year. Retreat was minor between 1967 and 1979. The retreat rate since 1979 has been greater than 38 m/year, with a total retreat of 700 m. The nunatak in the middle of the glacier, which was beneath the ice in 1940 is now 90 m above the ice. The section of the glacier below the nunatak in 2002 is stagnant with no crevasses. Indicating this glacier will retreat at least to the base of this rock knob, which will then no longer be a nunatak. 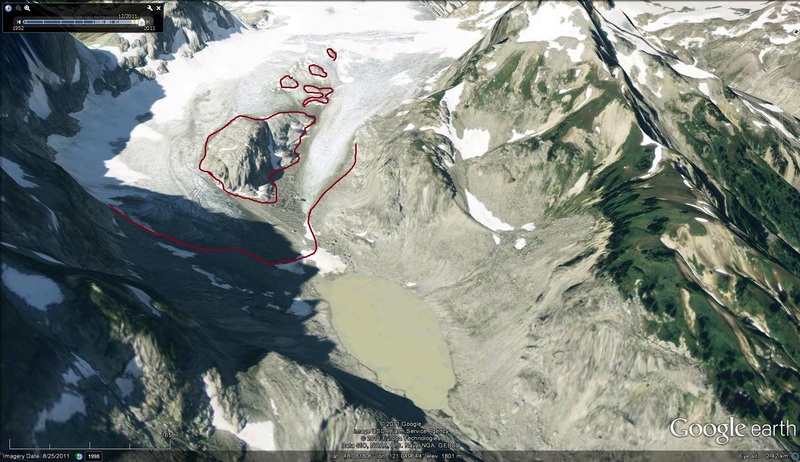 A comparison of Google Earth Imagery from 1998 and 2009 illustrate the appearance of numerous new bedrock knobs in the area where there was an icefall in 1995.
survive The upper portion of the glacier has retained its snowcover in recent years indicating the glacier can survive current climate at a much smaller size. Above is a pair of Landsat images from 1984 and 2013 indicating the 2600 m retreat of Antler Glacier in that period. Below is a detailed analysis of the glacier. The Antler Glacier is an outlet glacier of the Juneau Icefield. 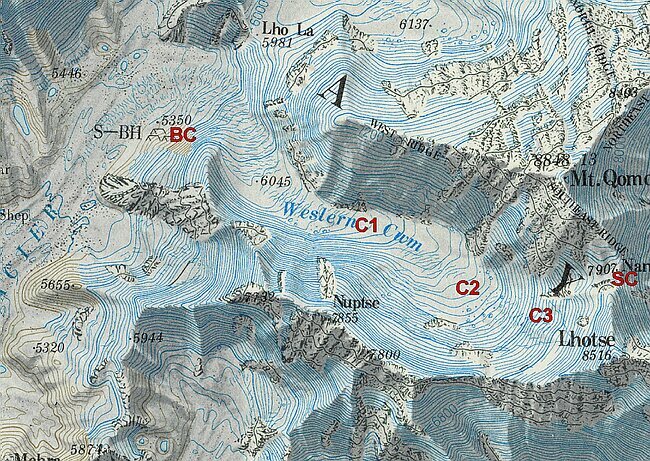 It is actually a distributary glacier of the Bucher Glacier. It splits from the Bucher Glacier 8.5 km above where the Bucher Glacier joins the Gilkey Glacer as a tributary. In 1948 it spilled over the lip of the Antler River valley from the Bucher Glacier and flowed 6 kilometers downvalley to end in a proglacial lake. The glacier was 6200 m long in 1948. Note the comparison of the USGS map based on 1948 photographs and the 2005 satellite image below. My only chance to see this glacier in person was in August, 1981 scouting the geology along the Bucher Glacier. Antler Glacier disappeared downvalley into the fog and light snow flurries. The terminus not in site, and icefall to daunting to wish to descend. 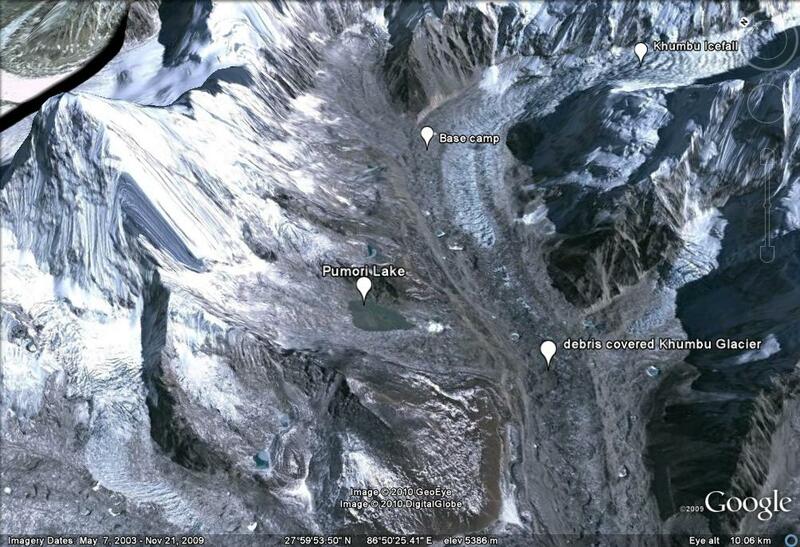 By 2005 the glacier has retreated almost to the lip of the valley, a 5400 m retreat which is 85-90% of it total length. The Lake -Antler Lake- has expanded from a length of 1.6 km to 4.2 km. The lake is a gorgeous sight, and the valley once filled by the glacier is now nearly devoid of glacier input. The retreat is largely a result of reduced flow from the thinning Bucher Glacier which no longer spills over the valley lip significantly. As the Bucher Glacier continues to thin, the Antler Glacier will cease to exist. This thinning is due to increased melting (ablation) of the glacier. The neighboring glaciers Field and Gilkey Glacier have also thinned and retreated considerably.